Do you require CAD data, product data, software or the right technical documentation for your product or project? The quickest way to find what you are looking for is in online support under data & documents! Data & Documents: Document search, CAD data and more. CAD data – an important basis for engineering! Simply download CAD data for SEW-EURODRIVE products in numerous formats. 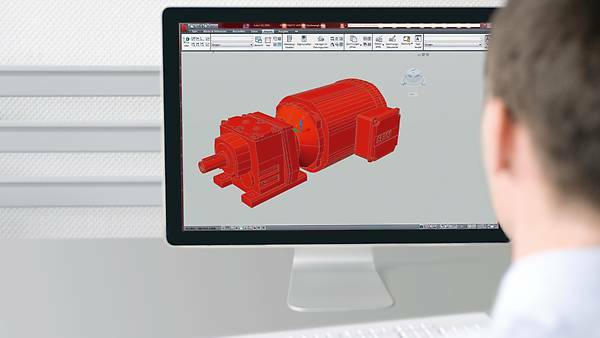 Or integrate the product easily within your CAD environment with a single click. You just have to enter the serial number or the relevant type designation of our product and select your desired CAD model. Good documentation gets you moving forward! High-quality catalogs, system manuals and other manuals from SEW-EURODRIVE help you to select and configure the ideal components and systems for your needs. High-quality operating instructions support you to install/assemble, start up and operate our product without any difficulty. This lets you deal with necessary servicing more efficiently. Product data – useful information about your product! Directly after your serial number is entered, we show you a compact overview of all important technical data and additional information. Software – the perfect addition to our products! Simply download the necessary software for planning or startup of your product. for our products is available directly under Data & Documents. for our products with a range of search options, e.g., by using your order number. Available in more than 20 languages. provides you with technical information for your product and can be downloaded as a PDF or as an Excel file. such as SEW-EURODRIVE Workbench, EPLAN macros and also MOVITOOLS® MotionStudio is available for you to download directly. In data & documents you do not just have access to individual documents. In just a few steps you can create comprehensive documentation packages for multiple transactions or entire projects. This is how it's done: by using a project reference or other search criteria you can select several transactions in the transaction overview and combine documentation into a single document package. If you know the order or quote number from us, you can also access your documentation package directly under data & documents. Do you know about our SEW Product ID app? This app from DriveBenefits provides all the relevant information on your product at a glance. Simply enter the serial number from the nameplate. Aside from direct access to specific documentation, the app also makes it possible to visually check the mounting position using a product image. Do you need advice on a specific inquiry? Just send us a message with your questions.